An artist's rendering of a proposed Tehachapi Super Walmart. When will Walmart open? What are the next steps for Walmart to break ground in Tehachapi? As the previous year has shown, Walmart is getting closer to finalizing plans, but there are various factors that have come into play. Over the last two years, Walmart has submitted plans to the city of Tehachapi for the design of the building at Tucker Road and Tehachapi Boulevard, agreed to more than $1 million in special fees and taxes and has updated the environmental impact report. 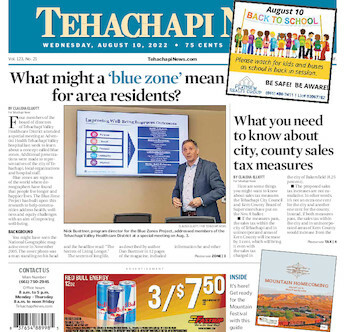 It is, however, up to Walmart to follow their own business plan that is constantly changing according to their needs, Jay Schlosser, development services director for the city of Tehachapi, said in an interview with Tehachapi News. Readers have asked about the status of the project on the Tehachapi News Facebook page. The final steps before groundbreaking, he said, are for Walmart to request a building permit and an encroachment permit from the city. “We have had very consistent communication over the last year that points to construction. However, even though they give us projected dates of when they will start, it has and continues to be up to them on when they will move forward with this project,” Schlosser said. What has Walmart agreed to in the last two years? In the summer of 2017, Walmart agreed to pay $99,660 in the first year and continue paying that amount annually to be open for business in the 151,000-square-foot store. This tax was required due to the Mello-Roos Act Community Facilities District Act, in which the city could ask for fees in order to fund improvements, according to City Council documents. According to californiataxdata.com, the Mello-Roos Act Community Facilities District Act gives local city governments permission to collect special taxes or sell tax-exempt bonds. Walmart also agreed to pay the city of Tehachapi more than $1 million in additional fees to move forward with its project that includes water rights, installing a water line, widening Tehachapi Boulevard, installing traffic lights, and constructing a median on Tucker Road between Apple Avenue and Valley Boulevard. At the March 19, 2018 City Council meeting, Matthew Nelson, an attorney at Gresham Savage representing Walmart, said the company was shooting to start the construction process in a little more than a month. He added that a liquor license was being requested by Walmart to sell alcohol for consumption off the property and give samples to customers over 21 years of age and that this license usually meant Walmart would be starting construction soon. The license request was unanimously approved by the City Council. The land is located at the intersection of Tucker Road and Tehachapi Boulevard and as Walmart has been approved by the city and agreed to taxes and fees, it is up to the company to move forward. A date is currently not known. Walmart's corporate headquarters issued a statement July 3.